Τοποθετημένο στην καρδιά της Περιοχή Μιεονγκ-ντονγκ, το Philstay Myeongdong Boutique - Women Only είναι το ιδανικό σημείο από όπου μπορείτε να ανακαλύψετε τη Σεούλ. Από εδώ, οι επισκέπτες μπορούν να έχουν άμεση πρόσβαση σε όλα όσα η πόλη έχει να προσφέρει. Με την βολική του τοποθεσία, το ξενοδοχείο προσφέρει εύκολη πρόσβαση στους προορισμούς της πόλης που πρέπει οπωσδήποτε να δείτε. Με τις υψηλού επιπέδου υπηρεσίες και την μεγάλη ποικιλία ανέσεων, το Philstay Myeongdong Boutique - Women Only δεσμεύεται ότι η διαμονή σας θα είναι όσο πιο άνετη γίνεται. Κορυφαία χαρακτηριστικά του ξενοδοχείου συμπεριλαμβάνουν τα δωρεάν WiFi σε όλα τα δωμάτια, αυτόματο πλυντήριο, φύλαξη αποσκευών, ασύρματη σύνδεση Wi-Fi σε δημόσιους χώρους, χώρος καπνιζόντων. Το Philstay Myeongdong Boutique - Women Only διαθέτει 10 δωμάτια. Όλα τους είναι διακοσμημένα με γούστο και πολλά από αυτά παρέχουν ανέσεις όπως επίπεδη τηλεόραση, ασύρματη σύνδεση internet (δωρεάν), δωμάτια για μη καπνίζοντες, κλιματισμός, θέρμανση. Εξάλλου, το ξενοδοχείο διοργανώνει πολλά ψυχαγωγικά δρώμενα έτσι ώστε να έχετε πολλά πράγματα να κάνετε κατά τη διαμονή σας. Με την ιδανική του τοποθεσία και τις καταπληκτικές του υπηρεσίες, το Philstay Myeongdong Boutique - Women Only θα σας ευχαριστήσει σε πολλά πράγματα. I absolutely loved my stay in this hostel. It's pretty straight forward, everything you would want in a hostel. What I really commend is the staff, they are so nice and very, very helpful! They go out of their way to help you when you have concerns. Thank you so much! Will definitely stay here if I go on solo to Seoul again! great location and within 3mins walk from subway exit 4. Not so convenient for traveler with heavy bags as you have to carry the luggage using staircase. But luckily there was a helpful male staff during checked in who assisted me to carry my bag to my room. Definitely will visit again. Hello, Lim! Thank you for giving us a good review! I am always here to help our customers! When you visit us again, I will definitely help you again, Thank you so much! I liked the wooden bunk beds with curtains, there were 4 sockets and a locker for each bed. The whole hostel shares 2 toilets, and the showers reminded me of college dorm haha, but everything went okay for me. Staff is helpful and can communicate in English and Chinese well. Location wise it's great, and within walking distance to Namdaemun and Myeondong. Good location, staff is prompt in answering querries online, cleanliness well maintained. Maybe its my first time to stay in a bunk bed so i was not comfortable enough to stay so much time in a hotel.. Hope that on my next visit u already have room for solo or couple, even just small place will be fine... Thanx for the experience ill be back again..
Hello, Customer! We really appreciate that you gave us a fantastic review! We are happy that you enjoyed it here! You would try to make more rooms for 2 people, Thanks for the advice! Hope to see you here soon! Have a good day! Space inside the room is a bit small, especially with all the luggages. But what I did during my last night when I needed to fix all my things was to bring everything out of the room to the common area of our floor. Location is very near the subway so going around was easy for me. Also near the bus stop for the airport. Very convenient and worth the price! Hello, this is Philstay MDBTQ. Thank you for a kind review. Hopefully you enjoyed your trip in Seoul. Have a nice day. So convenience for dinner and midnight snack! The whole Myeongdong street have hundred of food truck & restaurant! Just cross a road. The bedroom quite comfortable, the bed was big enough and private enough. Staffs were nice too! Help me a lot! Someone comment on the bathroom, there're 3 have a door to close. So it's ok. Will stay here again if visit Seoul again! I stayed here for a few nights and everything as value for money and the location was awesome. 5mins no stairs walk to airport shuttle busstop. However, I met some inconsiderate tourists in my 4 bed capsule. Lights out were requested at 8PM as "she needs to sleep"? So when I came back to the room at 9pm and on the lights, she started shouting and hurling chinese vulgarities (unfortunately I could understand chinese perfectly). Person B was videocalling on her bed the entire night till 2am. I was awaken at 5am by Person C packing and banging stuff in the room and I am a heavy sleeper. All in all, hostel was good, but it depends entirely on who's in your room. Hello, this is Philstay MDBTQ. Sorry for the inconvenience. We will try to improve this problem ASAP. Thank you for a helpful review and have a nice day. The whole place is infested with mosquitoes, couldn't have a proper night's sleep with them buzzing in the ears. Staff gave me repellent which I sprayed all over the room but I was still bitten (mosquitoes seem to love us - blood type O). The next morning, she changed me to another room but the mosquitoes are everywhere, even in the corridors/seating areas. The place is also crowded with people (with huge luggage) who are there to buy things back to China to sell and many are on their phones even when the lights are off. I moved to another accommodation which was WAY better. Hi, customer. There has been insect check every week. No insects exist in this freezing weather, We have never been told that there were mosquitoes in our property in the Winter, We were just wondering where these things came from. So I am so sorry that you saw insects here, Apologize! We also keep customer's luggage for free for your convenience. Sorry for the inconvenience again. The hostel's location is really really great. It's very near to Myeongdong Station (Exit 4), the night market and the cable car to N Seoul Tower. The area(kitchen, lobby and so) is quite small but the room and sleeping space is big enough for you and your things. The staff are really friendly too. I would recommend philstay because of their reasonable price, location and I GOT SUPER JUNIOR'S ALBUM FOR FREE!! HAHAHA! Hello, Eileen! Thank you for your amazing review for us! We were pleased that you enjoy it here! Hope to see you soon Here! And you are lucky to get super junior's albums for free! haha Thanks again and Have a nice day! The hostel is located right next to Myeong Dong station (exit 4). Very convenient to move around and to/from the airport. Plenty of food choices within 2 min walk. As it's women-only hostel, it's relatively clean but you may expect to hear hair dryer in the middle of the night. Though I was staying in the 8 people room (room B), I don't feel crowded. The sleeping space is big enough to leave your other stuff in it. Curtain helps a lot in creating privacy. Small towel (changeable daily), a hanger, a small basket, and slippers are provided. The room has no window but air-conditioned and the bed is very comfortable. The only drawback is the common space is too tiny. You can't hang around in the small lobby (also used as kitchen, breakfast place, and luggage storage) for too long. As a result, you can't expect social activity like chit chat to share travel stories, etc. with other travelers. Most of them are Chinese and they seem not to be so interested in making a conversation in English. Hello, Wansiri! Thanks for taking time to give us a good review! We really appreciate it and I hope to see you here soon! Hello, Erika! Thank you so much for giving us an amazing review! :D and Thank you for choosing our hostel again too! Our hostel is located in a very convenient place which would make your trip a lot easier! I am really glad that you enjoyed staying at our hostel! I still remember you and your friend, you both were also nice! I was happy to help both of you! We have improved and changed some problems found by customers! We will be always focusing on cleaning our property as much as we can! We really look forward to seeing you here again, Thanks again for taking your time to give us a good review! Hope to see you soon! Hopefully everything goes well for you Erika!! Best wishes! First solo experience and stay at dormitory. Caught few times the room mate didn't lock the door when they go out, feeling insecure. Friendly staff. Location is superb, opposite of Myeongdong night market. Staff is not super helpful; shared toilet ventilation is not good. The boutique is 1-minute walk from Exit 4 of Myeongdong Metro Station. The room was clean and the personal space (your bed) was spacious. Lockers were available below the bunker, but cannot accommodate very bulky luggage. The roommates followed the rules and caused limited disturbance. The room only allows one person to pack her luggage. Packing at the corridor is recommended at night time. Problems mentioned in previous comments, like door-less bathroom and noisy hair drying after 12pm have been rectified. Given various restaurants in the vicinity and the low room price, I think simple breakfast (toast buffet) is reasonable. One drawback of the stay is that the room was provided with warm air and thick bedding in winter that I was sweating for the whole night. Hello, customer! We are really happy that you enjoyed staying here! Sorry for the inconvenience that you experienced here! We will try to make it better when you come back again, Thank you so much! Only suggest people stay 1 or 2 nights, if you would like to stay longer, need to really think about. Pros: 1. prime location, 2 mins walk next to Myeongdong station, very easy to find. 2. Very good WiFi, signal never broke up. 3. Can use hairdryer in midnight as they put one in toilet. Cons: 1. common areas are very small and pack of mainland Chinese buyers. 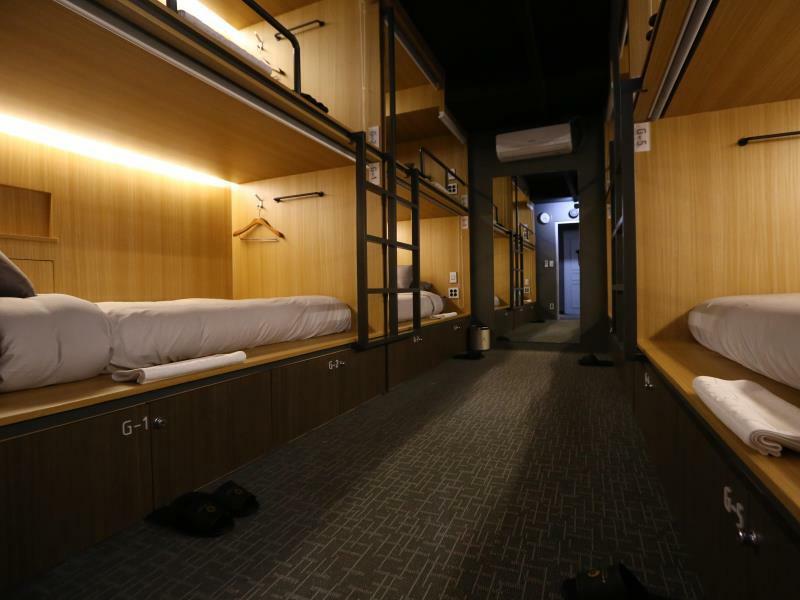 Because of this, unlike normal hostel, don’t expect to meet new friends in there. 2. Only 3 extremely small toilets in the whole hostel. Very inconvenient 3. Construction work on soundproof is poor. Even the door close, you can still hear people walking and talking in the corridors and common areas. You will be even able to hear next room snoring too. And when the buyers packing up stuff during midnights, the sound of plastic warp is very annoying. I had a very bad sleep for all 3 nights stay. I was back to hostel around 11-12pm every night and tried to sleep at 1am, noise still around. Hello, customer! Thanks for taking your time to give us a review! We are sorry that you felt uncomfortable with some things that you mentioned above. We always try to keep it clean and calm. Hope to see you again here! Hello, Chutima! Thank you for giving us this amazing review! Hope to see you here soon! Have a good day. Hello, Chutima! Thank you for giving us this amazing review! We are just here to help all of you : ) Hope to see you here soon! Have a good day. It was a little difficult to find but the map on Agoda was interactive enough to be able to accommodate my needs. The beds were comfortable, but I’d say that if you stay in a 6 person dorm to request a top bunk since it can be difficult to climb if you’re accident prone. The staff is super friends, especially Ian! She’s so great! The shower had good hot water. There’s a smell in the hostel so be warned it’s kind of s strong septic smell. The location is perfect 1 stop from Seoul station and maybe 26 min from Gangnam express bus station. I’d say bring your own towel. A lot of people stay here for a while their stuff is everywhere inside so it can get a little stale in there. No windows in the room. Overall good but definitely not for children and families. Σταθμός Υπόγειου Σιδηρόδρομου Myeong-dong στα 0.17 χλμ.